It’s a new year and so once again it’s time to dust off my model portfolio and review (and then try to improve) its performance. This year I’m going to look at performance, sales, purchases, mistakes made and lessons learned. 2018 was not exactly a record year for the UK stock market, with the FTSE All-Share and my model portfolio falling by 9% and 13% respectively. Underperforming the market index in a year is mildly disappointing, but as a long-term investor what matters to me is long-term performance, not performance over a single day, week, month or year. Ideally I’d like to be ahead of the market by 3% per year on average, which would put my target annualised return at 10% compared to the market’s expected return of 7% (based on historic returns). In reality the margin of outperformance has, so far, averaged 1.6%, so I think there’s plenty of room for improvement. As stock market investors we are investing in companies, so the performance of those companies is, in the long-term, much more important than the ups and downs of the emotional Mr Market. For me, the best way to measure the performance of the companies I’m invested in is to look at their dividends. That’s because dividends are a concrete return from investing which is not subject to any of the ‘adjustments’ or other accounting tricks which can be used to massage a company’s earnings or even its revenues. Dividends aren’t a perfect measure though, especially if you’re looking at a single company. But if you add up the dividends from a portfolio of 20 or 30 companies then the long-term growth of that aggregate dividend should be a pretty good guide to the growth of the intrinsic value of your portfolio. The total annual dividends from both portfolio’s have marched upwards, reasonably progressively. 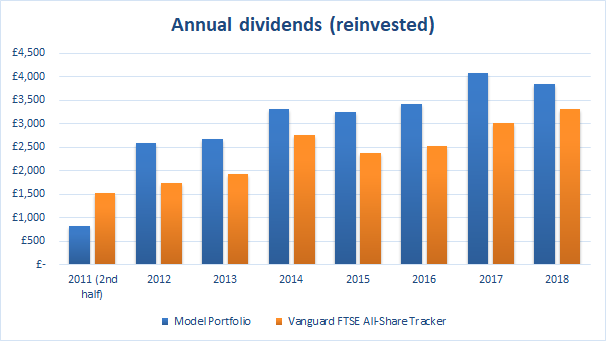 In fact, the All-Share tracker has managed to grow its dividend faster than my model portfolio, with their 2012-2018 annualised growth rates at 11.2% and 6.7% respectively. To be honest, I think the 11.2% dividend growth rate of the All-Share is a bit of a short-term anomaly. It’s probably a recovery from the immediate post-crisis years, and the index is very unlikely to keep growing its dividend at 11% per year. As with total returns, I’d expect dividend growth in an accumulative All-Share tracker (i.e. one that reinvests dividends) to be around 7% or so over the long-term. As for my portfolio’s 6.7% dividend growth rate, it’s below the market’s expected 7% growth rate. That’s probably due to the fact that my defensive value strategy has changed slightly since 2012, moving away from ‘value’ stocks and more towards ‘quality’ stocks. As I’ve made this shift, the portfolio’s holdings have moved from high yield low growth companies towards lower yield higher growth companies, and this has probably held back the portfolio’s dividend growth. That sounds like an excuse, but it isn’t, and I’m happy to be judged on my portfolio’s performance over the next five years, where the balance between quality stocks and value stocks is likely to stay about the same. As usual I followed my process of monthly trades, alternatively selling a holding one month and replacing it with something (hopefully better quality and or value) the following month. In January I sold BP. After almost seven years in the portfolio, BP was no longer the sort of company I was looking to invest in. It isn’t a growth company, it isn’t a defensive company, it has low margins and low returns on capital and its main products are all commodities, where sellers have virtually no pricing power. None of these are attractive features, but when I bought BP in 2011 I was more interested in value than in growth, profitability or consistency. Over the years my views have changed and I now prefer to invest companies with more pricing power, more growth opportunities and less need for massive ongoing investment in expensive physical assets. BP wasn’t a complete disaster though, having produced a reasonable 6% annualised return over almost seven years. In March I sold AstraZeneca for an annualised return of 11% over two and a half years. AstraZeneca’s share price had held up well, but its results were flat-lining and I was concerned about the company’s use of ever-more debt to fund its massive research and development needs. In May I sold Beazley, a leading insurer. This sale was based mostly on valuation as I still very much like the company. The share price increased by 80% in less than three years, massively reducing the margin of safety between the company’s market value and its intrinsic value. When the margin of safety is reduced, the investment becomes more risky. That’s because we can never actually know what the intrinsic value is, hence the need for a margin of safety between the market price and what we think the intrinsic value is. If that margin of safety disappears, as I think it did with Beazley, then you may be left with an asset which is worth less than its current market value. And if that’s the case, selling at the current market price is probably the most sensible course of action. In July I sold BHP Billiton (now BHP Group). Like BP, this was another old holding, purchased in 2011 when I was much more interested in ‘value’ than defensiveness. The end results were far from reasonable, with an annualised return of just 2% per year over almost seven years. The main cause of the investment’s low returns was an excessively high purchase price. This is a lesson I have long since learned (which I first mentioned after selling Braemar Shipping in 2017) and these days I’m much more cautious about investing in highly cyclical commodity companies. In fact, my maximum purchase valuation for highly cyclical companies is now three-times lower than that of other companies (specifically, a PE10 and PD10 ratio of 10 and 20, respectively, instead of 30 and 60 for defensive and somewhat cyclical companies). Towards the end of the year I was somewhat sad to sell two excellent companies, Senior and Victrex, both on valuation grounds. I sold Senior in September for a total return of 48% in just over two years. This excellent result is of course mostly down to luck. Yes, the company performed well during its short time in the portfolio, but most of the returns were down to a mood change from Mr Market, where he decided (entirely unpredictably) that this company was worth much more than he’d previously thought. I still like Senior and would happily reinvest, but only if its share price declines enough to restore a healthy margin of safety. In November I sold Victrex for 2018 best result, which was a 93% return in just over two years. Like Senior, I still like Victrex and think it’s a very good company, but the price just skyrocketed during 2018, continuing a run which took the price from 1400p in 2016 to more than 3400p at its 2018 peak in October. Unfortunately I missed the peak price by a month, finally selling at 2750p, but I can’t complain. Victrex has since continued to perform well as a company, and has continued to decline as a stock, which has reopened the margin of safety. With a bit of luck, the margin of safety will widen enough for me to reinvest in 2019. As for new investments, there were the usual six, purchased one month after each sale, using a mixture of proceeds from the preceding sale as well as any cash from dividends floating about in the account. These six new holdings include leading companies from various markets, such as retail, food services, distribution and insurance. I expect to hold all of them for several years at the very least, depending on how the companies perform and how well their margins of safety are maintained. Most investors are bound to make a mistake of one kind or another each year, and in 2018 I made one mistake which stands out. One of the new companies purchased this year, an innovative and disruptive high tech company, has already cut its dividend and downgraded its expected results significantly. Because I’m a fan of diversification, the portfolio only had 4% or so invested in this company, so this isn’t the end of the world. However, investing in this company was definitely a mistake. But it wasn’t a mistake because it’s a basket case, because I don’t think it is. And it wasn’t a mistake because the investment’s total returns were bad, because I haven’t sold yet so I don’t know what the total returns will be. It was a mistake because the company didn’t have the sort of repeatable track record of success that I like to see. Its track record was too heavily based around a single ‘big win’ from a single product in a single market. Once that ‘big win’ was over, it wasn’t repeatable and the company has been downsizing ever since. As with all mistakes the best course of action is to a) admit it and b) make sure you don’t do it again. Which leads me onto the topic of lessons. 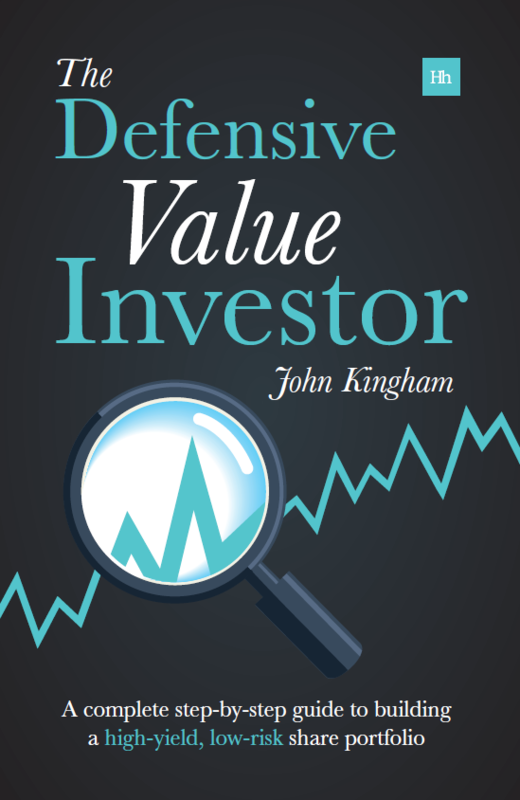 Having literally written the book on defensive value investing, you might think the strategy was now set in stone. But nothing could be further from the truth. Focus more on companies with a track record of repeatable success, preferably from companies that generate profits from lots of frequent ‘small wins’ rather than infrequent ‘big wins’. The dividend cutter mentioned above was an example of a ‘big win’ company. Although it does generate lots of profit from recurring service revenues and ongoing new sales, a very large portion of its profits over the last decade came from a single product, sold into a single market, where that market has now reached saturation point (perhaps somewhat similar to Apple and the peak iPhone phenomenon, but on a much smaller scale). AstraZeneca and GlaxoSmithKline are also examples of companies that rely on ‘big wins’. In their case, the big win is the development of a new blockbuster medicine which can then be patented and used to produce reliable fat profits over the following 20 years or so. When those patents run out, these companies need new big wins in the form of new blockbuster medicines to replace the old big wins, but that’s easier said than done as their performance over the last decade shows. That’s partly why I sold both of those companies this year (Glaxo’s post-sale review is coming soon). Focus on free cash flows and reported earnings rather than normalised or adjusted earnings. I have traditionally preferred normalised or adjusted earnings because they’re supposed to reflect the performance of the core business by excluding one-off incomes or expenses. But sometimes adjusted earnings give an unrealistically positive view of a company. This lesson was driven home by the second dividend cutter of 2018, a retail business which is struggling to cope in an online-first world. This company’s adjusted earnings handsomely covered the dividend, but those adjusted earnings ignored the cash cost of transforming the business into an online-first retailer. The reason for excluding these costs from adjusted earnings is that they were a one-off expense, and not part of the core business. That makes sense and it’s fine if the one-off expense lasts for a single year, perhaps two at the most. But in this case the adjustment has lasted for three years and has grown larger with each passing year. At some point a one-off ‘exceptional’ expense is no longer ‘exceptional’ and instead becomes a normal part of the company’s operations, and I think that’s the case here. The only constant is change, as they say, and long-running transformation-related expenses shouldn’t be called ‘exceptional’ or ‘non-core’. That’s partly why I’ve been writing about free cash flows recently. I want to tighten up my stock screen‘s ability to spot potential dividend cutters, and free cash flows and reported earnings are one step in that direction. Another lesson is the importance of decent gross margins. Focus on companies with ten-year average gross margins of at least 25%. In the past, I’ve focused primarily on return on capital employed as a measure of profitability, and I think it’s worked quite well. However, there is a fairly clear pattern: Companies in the model portfolio today that are struggling tend to have gross margins of less than 20% and sometimes less than 10%. The other three loss-making investments were more to do with 1) excessive debt-fuelled acquisitions, 2) balance sheet weakness and 3) paying too much for a highly cyclical company. So in my experience weak gross margins are a major source of corporate problems, and companies with thin gross margins are probably best avoided. So that’s my summary of what went on in 2018. It was an interesting if slightly negative year, in many ways. But one year is merely a single step on the road to retirement, financial independence or whatever it is you’re investing for. In my case I’m focusing on 2041. 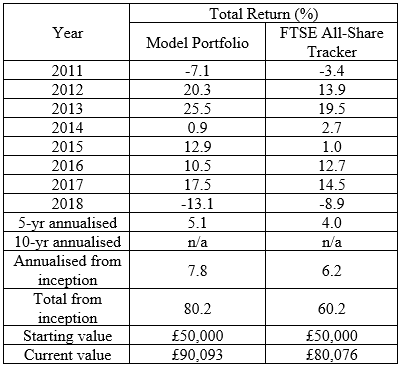 If my model portfolio has reached £1 million by then I’ll be happy, but it will take annual returns of around 10% or so to get there, so it won’t be easy. That’s a long way in the future, possibly beyond my lifetime, but it’s that sort of long-term target that makes it easier to ride out the rough patches and bumps in the road, of which Brexit will be just one of many. Thanks for sharing your learned lessons as well as your performance. I also study cashflow and Income statements in order to discover growing dividends. In Spain, we do not have a dividend culture among publicly traded companies. Nevertheless, I have a tested a strategy in dividend safety (P-score) for the past 11 years and appears to work. No problem Jose, good luck with your P-score. Thanks for sharing and interesting to see. 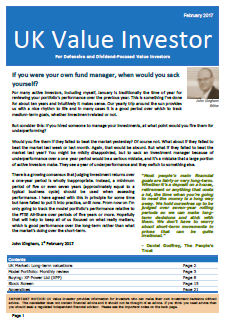 In my experience of having evolved my style over many years, it is how the portfolio holds up in down markets that makes the difference to the long run performance. A few big down years can undo years of return. I started as a dividend focused investor but realized I was ending up picking fragile businesses who did not have opportunities to retain earnings in good years to strengthen their long term earning power by reinvesting rather than distributing earnings as dividends. In some cases like BP , Astrazeneca and GSK, a high dividend yield hid the fact that fundamentally there was little long term value creation within the company. My results improved significantly since I moved to a focus on total return and stopped using dividend yield as a criteria. The other shift I made was to look at global businesses rather than UK listed – i.e go wherever quality businesses are. Interestingly this approach worked well last year where my return was about +3.9%, ahead of the conventionally defensive bond heavy or dividend yield focused portfolios. Possibly. Although I think the most important thing is how the underlying companies are performing, rather than their share prices. That was my experience too when I was more focused on value than quality. However, sometimes it works out well when the valuation is very low. Even if the company just treads water, you can still get a very good return when (if) Mr Market becomes more optimistic about the company and re-rates its shares. I focus on total returns too, but dividend income is a part of total return, so I still use yield as a factor, but it’s just one factor out of many. I’ve thought about this on and off over the years and for me I’m not sure the additional hassle is worth the effort. There are lots of companies out there internationally, but there are also lots of different accounting rules, report layouts and so on. Fortunately the All-Share is quite large, and I’ve found its several hundred companies enough to work with, at least so far. But I agree that in theory investing internationally makes the most sense. John, I don’t believe you’ll ever retire, you enjoy this game too much. You don’t want to hanging that label around your neck do you? PS : Well done on Dunelm, it seems I was far too pessimistic on it. Happy New Year, Ho Ho Ho, etc. You’re probably right about retirement; I feel like I’m semi-retired anyway and have no desire to go full demob. PS… let’s wait for Brexit to actually start before we crack open the Champagne on those retailers! My results were -8% in my UK portfolio and+1% in my North American portfolio. Biggest mistake selling half of my big winner because it was scaring me, even though it was still under 5% of my combined holdings over both portfolios. After I sold it went higher. Find it hard to think of a success I had last year except holding my nerve and not selling everything :-). That sounds like my definition of success! Many of my holdings were down by huge percentages, but the fundamentals are (so far) mostly still intact, so it’s a case of taking advantage of a nervous Mr Market rather than taking advice from him. Well done for continuing to review your portfolio. It is a bit awkward for us non-subscribers to gauge exactly what has happened — (I can’t think of a ‘high-tech disrupter’ that would have had a dividend to tempt you) — but we can get the picture. Lemsip said earlier that “it is how the portfolio holds up in down markets that makes the difference to the long run performance.”. I agree with that. Bull-market geniuses are found out in bear phases, which is when the best opportunities for more sensible investors arise. Anyway, the one thing that struck me in your performance table was that when the market suffers a down year, your portfolio does worse. That surprised me given your portfolio is perhaps (I don’t know for sure) biased towards large, stable, divided payers, which tend (in theory) to hold their value better during market downturns. I must admit that is a very annoying trait and one I would rather it didn’t have, seeing as I want it to be a ‘defensive’ portfolio. For 2018 the larger decline was a mixture of things. Higher exposure to the UK than the index; higher exposure to retailers; more dividend cutters than I’d like. Those are all things I can fix, I think, so we’ll have to see how things pan out over the next few years as I tweak the portfolio and await the next downturn. As for the smoke-and-mirrors around the portfolio, it’s necessary I’m afraid otherwise it isn’t fair to paying subscribers. But hopefully these and other free posts still have a lot of value. Oh, and congrats on your SharePad side-gig; it’s probably the best platform to write for, I’d say. On my underperformance in down years, I think it’s partly down to the fact that value investors are often early to buy on the way down and early to sell on the way up. So I have been moving into unloved areas, the UK, retail, etc, and they’re still on the way down for obvious reasons. When (if) those areas recover, the portfolio will hopefully outperform, but only time will tell. I think there are different styles of value investing. However, I think defensive investing has to demonstrate it can defend against something – i.e bad markets as that is what qualifies the style as such. There are a number of value investors whose performance tends to be very volatile and they have extreme swings – check out the recent performance of David Einhorn, Bill Ackman and Bruce Berkowitz. and here in the UK Neil Woodford. Longer term these swings do tend to catch up and trash the record. Regardless, their styles wouldn’t qualify as defensive by any measure. The opposite end of the spectrum is Buffett in Equity and Howard Marks in credit investing – they generally do well in down markets and keep close enough even if underperforming slightly in the good times. Having been through my own periods of getting slaughtered in down markets early in my investing innings, I found that defensiveness actually really contributes to outperformance . Some techniques I learnt to use more were keeping a cash buffer, global diversification and higher focus on high ROIC businesses and competitive advantage rather than accounting arcana. So far, it seems to have helped. I would still probably class my approach as defensive though. My portfolio’s ‘beta’ for example is 0.44, and the mean 1yr return is higher than the market while the standard deviation of 1yr returns is lower, so the Sharpe Ratio is quite a bit higher (i.e. more returns for less risk). Just about the only time my portfolio looks ‘riskier’ is on this calendar year basis, where it fell by more in 2011 and 2018, so I’m not exactly panicking about it being excessively risky. But I do agree that more ‘quality’ businesses with higher margins, return on assets or capital is a good way to go and I’ve been gradually headed in that direction for a number of years. Although I still have a few capital intensive low return businesses to offload this year. That is Micro Focus, the single technology stock in FTSE 100. Fair enough, I bought 3% after it went pear-shaped. I thought the market has exaggerated somehow. It ended up one of my best stocks for 2018. I have been lucky somehow last year, sold half of US technology stocks when achieved the $1 trillion mark (wish I sold all of them!). Being burned a bit by the US FDA on the tobacco in the autumn, although I thought I bought Imperial Brands cheap! Not sure what this had with Phillip Morris either, they do not sell in the US, but this stock went down as well! Overal I ended up -5% last year, which was a bit disapointing due to MSCI World TR doing -3.8%. But I think I am well possitioned for 2019, I have less reliance on technology stocks and I am better diversified accross sectors. Way to go and I am not sure I will retire either! Hi Eugen, good to see you back again. Micro Focus is a good guess, but it isn’t the company I invested in (and it isn’t in the FTSE 100). Great insights as usual John. However your use of the term “gross margin” is confusing. Tesco/etc gross margin is well above 30pc, not single digits. Do you mean operating margin? As for Tesco, I’m not sure where you’re getting your figures but e.g. it’s 2018 revenues were £57,491m and its cost of sales were £54,141m, leaving gross profits of £3,350m. That’s a gross margin of 5.8% and that’s fairly typical if you look back at Tesco’s past. Actually that isn’t bad for a supermarket, but it does leave the company with very little margin of safety against income or expense pressures (hence the crisis when Aldi and Lidl turned up). Thanks for the honest feedback about your portfolio performance in what was a year to forget in investment terms. I know there has been a lot of debate about attaching any significance to single year performance so I wasn’t expecting to see your post this year but I’m glad you did purely because, from an emotional point of view, it is reassuring to see that I’m not the only person to suffer 10% plus (paper) losses! I’m emotionally detached enough from my portfolio not to panic and sell but it’s hard to maintain enthusiasm to do the research for the next investment when everything is heading south. So thanks for reminding me I’m not the only one is this situation. Hi Steve, that’s the perfect response and is partly why I mentioned my underperformance this year. Yes, short-term performance is mostly irrelevant, but most investors don’t see it that way. Most of them (including the younger version of me) panic in down years and if there are two or three down years in a row, they sell up and lock in their losses. If I can help anyone avoid that fate then I’ll be very happy. Are you going to rebrand? “UK Quality Value” perhaps? I must say that my reading has drawn me to conclude that over the long term only “value” and “momentum” really work. I confess to being concerned. Hi James, no, I think ‘defensive value’ is the best label. I want to run a relatively defensive, high(ish) yield, value-focused portfolio, and looking for quality companies is a means to that end; not the other way around. There are also a lot of other defensive aspects to my approach, beyond just stock picking. That’s where the portfolio management side of things comes in, which includes broad diversification to reduce geographic, sector and company risk and rules about trading frequency to reduce behavioural risk. All that’s changed is the metrics I use to find good companies, and even there the changes are pretty small. I’ve always looked for ten years of consistent dividend payments for example, and I’ve just added a few tweaks and refinements to my criteria along the way. As usual it was good to read your annual performance review. You have been very transparent with your change in methodologies and learning. On a side note i was wondering though, Are you planning to release an updated version of your book? I feel that it should be updated for the current shift in the mythologies or is it too early to update? Yes there will be a second edition of the book. I have 2020 as a release date in mind as by then any strategy updates will have had time to ‘bed in’ for a while. Ultimately it’s a trade-off between the additional effort required to review an expanded investment universe (e.g. including US stocks) and the potential additional returns from that expanded universe. Personally I have my hands full reviewing just the UK market, and the potential returns appear to be ‘satisfactory’, as Ben Graham would put it, so for now I’m happy to stick with the UK rather than possibly overwork myself in pursuit of another percent or so of returns each year from investing internationally. I was wondering it would be interesting to see if you measured the performance of your portfolio according to book value such as ROCE, Cash Flow and etc. I say this because as a dividend investor if your intention is to increase your passive income then it becomes imperative to measure the performance of the business itself, not market valuation. For example, Altria dropped over 50% of its valuation between 1999 to 2000 and yet the company itself performed extremely well and those who held onto the stock achieved a return of 14% per annum between 1999 to 2017. If investors of Altria assessed their performance according to market valuation most would have written off the stock. My key measures for the portfolio are total value (which as you say is determined by market prices), dividend yield and annual dividends paid. Things like ROCE I assume are okay at the portfolio level given that I check them on a per-company basis. So the primary non-market measure of progress is annual dividends paid. Unfortunately the annualised dividend growth rate so far doesn’t make a lot of sense because my strategy has moved slightly from higher yield, lower growth companies to lower yield, higher growth companies. I expect the strategy to remain largely unchanged from now on though, so going forwards annualised dividend growth should be a more useful measure of ‘underlying’ progress. Also, it’s worth pointing out that the model portfolio is an accumulation portfolio, so all dividends are reinvested, hence its annual dividend growth rate will include reinvested dividends. I see what you mean. Part of my desire to focus more on book value is because the market value of a portfolio is more volatile. Therefore the performance of a company is likely to alternate based on market valuation. On the other hand, the book value approach is more representative of how a company owner/manager would assess the performance of a company which is not listed. It also forces you to evaluate the performance of a company from a business perspective. I’ve shifted to this approach because I’ve realised my aim is to hold only a few stocks for at least one or two decades if not longer, therefore, I need to shift my focus on book value to ensure my capital is being put to good use. It certainly takes a very long time to construct a spreadsheet to analyse the performance of a company! Reg, that sounds like a good idea. Book value should certainly be less volatile than market cap, and as long as that equity is producing reasonable returns, the ‘intrinsic’ value of the portfolio should increase more or less in line with book value.